Vicodin is a partially synthetic, combination oral medication that includes Hydrocodone and Acetaminophen. Hydrocodone is used to treat moderate to severe pain. "Tylenol", which is the brand name for Acetaminophen, is added to this oral tablet, capsule, or liquid as an adjuvant. Adjuvants augment and modifies the pain killer properties of other pain relievers (sometimes called analgesics). Vicodin is the trade or brand name of this medication and is manufactured by Abbott Laboratories. 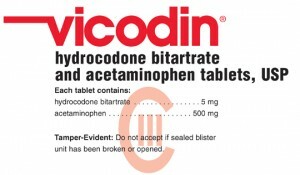 Many companies make the generic form of Vicodin called Hydrocodone. As a comparison, Hydrocodone is about one-half the strength of Morphine. Hydrocodone, the main ingredient in Vicodin, was first synthesized in Germany in the early 1920's. Vicodin is available in many forms and doses. Standard Vicodin tablets are 5/500 mg, Vicodin ES is 7.5/750 and Vicodin HP is 10/660. Vicodin maximum doses should be followed carefully as this medication is generally designed for use on an as-needed basis. To avoid experiencing too many side effects, it is best to avoid taking your available doses until you truly need them for pain relief. In the U.S., Vicodin and Hydrocodone are listed as Schedule II, III, and IV "narcotics". Controlled substances, such as Vicodin, are organized on different listed based upon their potency and risk of dependence. Certain strengths of Hydrocodone are Schedule III, while other preparations can be classified as Schedule II or Schedule IV. Most Schedule IV medications include cough suppressants. Hydrocodone has a soothing effect on chronic cough. Vicodin is most commonly used to treat short-term acute and chronic pain associated with an injury or surgical procedure. As a narcotic, this medication has the possibility to become addictive. For this reason, doctors hesitate to provide patients with Vicodin over a long period of time. In rare cases, this medication may be used to treat chronic pain conditions such as migraines. Do I need a prescription for Vicodin? Yes. A physician/surgeon, physician's assistant, dentist, or advanced practice nurse must prescribe this medication to you. Remember that Vicodin already has Acetaminophen combined in the product. Various doses that you may be prescribed include: 2.5/325, 2.5/500, 5/325, 5/500, 7/325, 7.5/500, 10/325, 10/500, and 10/750. The first number indicates the milligrams of Hydrocodone. The second number (after the "/") indicated the milligrams of Acetaminophen. Hydrocodone syrup contains 7.5 milligrams of Hydrocodone and 500 milligrams of Acetaminophen per 15 milliliters (one tablespoon of liquid). Combinations of Hydrocodone and Ibuprofen are also commercially available with a prescription; however, usage of these products have dropped substantially since 2005. What precautions should I follow when taking Vicodin? Be sure to tell every healthcare provider (including your dentist) you come into contact with about all your medications and medical allergies. Be sure to tell your healthcare provider if you are pregnant, attempting to become pregnant, breast-feeding, or pumping breast milk for your infant. Keep all prescription and over-the-counter medication in a safe, locked location (away from infants, toddlers, and children that may not know any harm). Always consult your healthcare provider when taking prescription and over-the-counter medications. Be sure to tell every healthcare provider you come into contact with about all your medications and medical allergies. 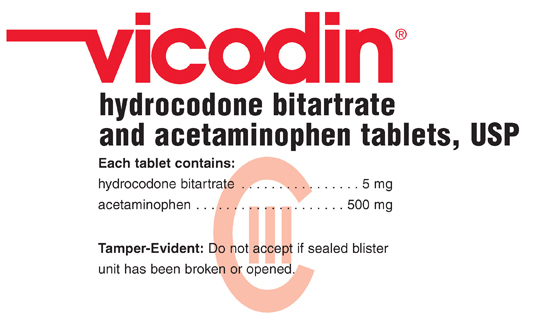 Avoid taking additional Acetaminophen when taking Vicodin, as the combination product already has Acetaminophen in it. Avoid taking other "narcotic" or opioid pain relievers while taking Vicodin, as this can result in adverse effects (namely, an increased risk of overdose). Avoid drinking alcohol of any kind (beer, wine, or liquors) when taking Vicodin (as this may result in adverse side effects). Avoid taking Benzodiazepines (such as Alprazolam, Diazepam, or Lorazepam) with Vicodin (as this may result in a harmful drug to drug interaction and side effects). Avoid taking prescription Sedative/Hypnotics or Sleep Aids (such as Eszopiclone, Ramelteon, or Zolpidem) while taking Vicodin. Using these medications together may result in changes in breathing, sedation, and dangerous side effects. Avoid driving, operating equipment, or placing yourself in safety-sensitive job positions (such as climbing ladders) while taking Vicodin. Potential side effects of Vicodin can be drowsiness or dizziness. One potential side effect of Vicodin is constipation. Talk to your healthcare provider about increasing your fluid intake. Fresh fruits and vegetables may also be helpful to prevent pain killer related constipation. Do not take more than 3000 milligrams of Acetaminophen daily. If you, or someone you love, has overdosed on Vicodin, call National Poison Control Center a 1-800-222-1222 immediately (or dial 9-1-1) as this is a medical emergency.